IoT Wireless – Go-IoT – The one stop solution for your IoT needs! When it comes to wireless IoT communication, one size does not fit all. Wireless communication is one of the most important part of IoT. Devices, sensors and actuator communication with each other is a requirement in the world of IoT. However there are many wireless technologies out there. IoT projects are very different, when it comes to inter-device communication. Sometimes only short range communication is needed. Other times range of many kilometers is required. Bandwidth and security requirements are also very different from project to project. 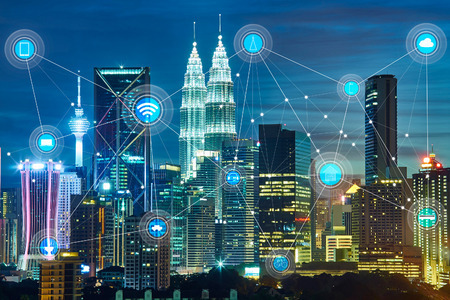 For those who are interested to better know the different IoT wireless technologies, we strongly recommend this article. To answer the demand for multiple wireless technologies we decided to offer our customers many of the most popular, as DINGO plug-ins, plus the newest cutting edge sub-1GHz technology we call WINGO. Bear in mind that a DINGO BACKBONE can host up to 3 plug-ins on its Base Board (DBB). For example such a DBB could be populated with a WINGO, a Zigbee and a 2G/3G plug-ins plus a WiFi dongle. Such a configuration could communicate with all of those "ports" plus the Ethernet port, in a way bridging those all together in a single box fully connected to the Internet. Normal Wi-Fi is supported by DINGO using USB Wi-Fi dongles. We recommend the "Rasperry Pi dongle" (here...) as well as the "USB Wireless N GNU/Linux Adapter" (here...). We have tested those thoroughly. Those work very well. DINGO Manager has a setup-page for wireless network. This simplifies a lot the WiFi configuration work. Our BACnet/IoT is independent of whether communicating is over Ethernet or Wi-Fi. 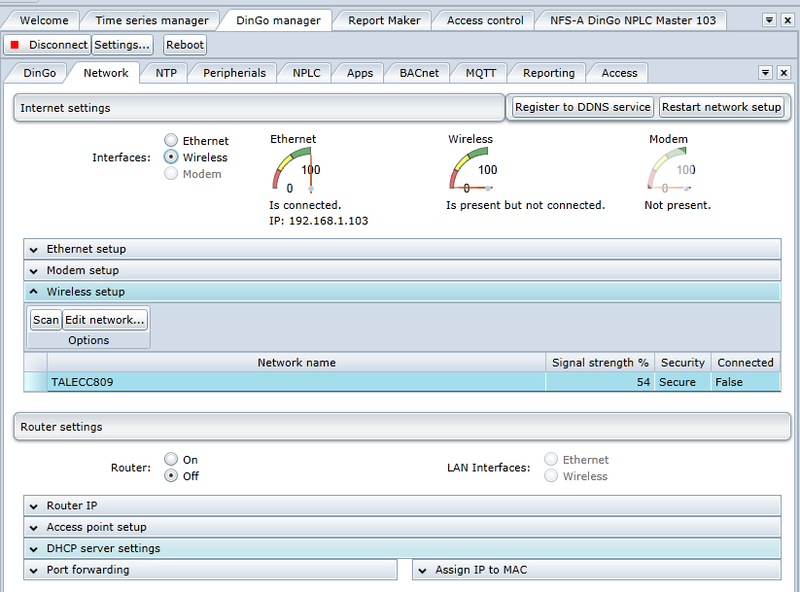 DINGO BACKBONE can easily be configured as a Wi-Fi Hotspot. As that board does not have any external USB connector the USB-plug-in is needed at the Base Board to enable Wi-Fi. Our WINGO solution is intended mainly for our upcoming family of WINGO sensors. WINGO sensors and actuators are based on Texas Instruments solution for sub-1GHz IoT wireless solution (see here...). WINGO can also be used to interconnect multiple DINGO BACKBONEs in a mesh network. Our main network protocol for WINGO is 6LoWPAN. 6LoWPAN is becoming the world standard for sensor communication. It supports mesh networking, extending the range to virtual infinity. In addition selecting that protocol has enables us to port our BACnet/IoT Server to the WINGO sensors and actuators, such that those become native BACnet devices, which is a huge advantage. ZigBee is a wireless technology developed as an open global standard to address the unique needs of low-cost, low-power wireless M2M networks. As this technology is today widespread in the field, we decided to support it with our DINGO plugin for XBee/ZigBee. Currently we have no software support for this plug-in. So it is up to our customers to select software for it. This is due to the fact that we are more focused on our WINGO solution at the moment. BACnet specifies addendum for Zigbee support. If anyone in our BACnet/IoT community has interest implementing that addendum, we would be more than happy to help on that. Feel free to contact us. Wireless M-Bus is provided with the same plug-in as WINGO, but different software stack. As such Wireless M-Bus is not a technology to connect intelligent sensors/actuators and devices. In the DINGO product line we group Wireless M-Bus as one of the peripheral buses supported by DINGO Peripheral Manager (DPM). When it comes to connecting a local device network to the Internet, it is frequently such that connecting through the office/building network is prohibited because of security reasons or lack of Ethernet. In other cases an Internet link does not exist at all, for example in a street cabinets for streetlighting or similar. The solution for such situations is to connect via a mobile 2G/3G/4G network provider with a data-SIM card. DINGO offers the GSM/3G plug-in for this purpose, plus DINGO Manager software for configuration. With this plug-in a DINGO BACKBONE can easily be configured as the Internet gateway for a device-network. In some use cases, for example in health care, it is required to have a backup-Internet connection in case of blackouts, etc. A DINGO BACKBONE with this plug-in and battery backup (available from us) can be configured as such a connection for the device network in a hospital, etc.